It's interesting how finding one source document leads to a new (to me) branch of the family. My great grand uncle, William Scott Pyle, was the younger brother of my great-grandfather, James Tolman Pyle. These two were the sons in James Pyle & Sons, the successful New York soap manufacturer of the late 19th century. William Scott Pyle was born in April 1856 in New York City. He died on January 1, 1906, in New York City, at not quite 50 years old. I had always wanted to know what caused his death at a relatively young age (and as a fan of FindAGrave, I was wondering where he was buried in order to set up a memorial for him) so I obtained his death certificate. 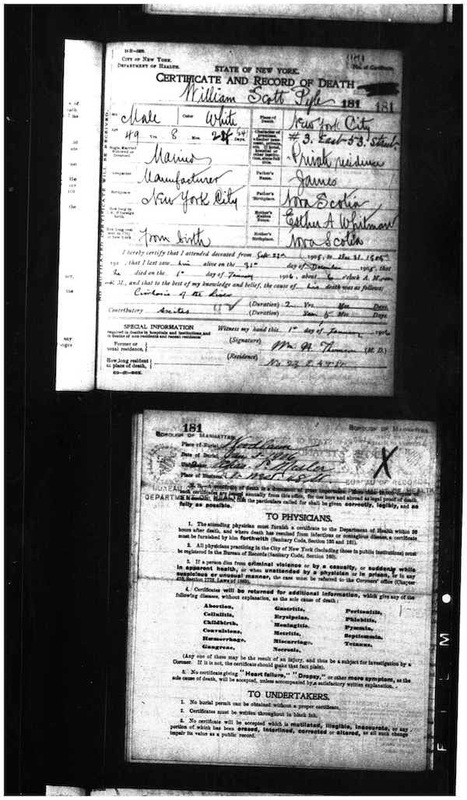 New York, New York, Manhattan Deaths, FHL Microfilm 1323106, Certificate No. 181. William Scott Pyle, January 1, 1906.; Family History Library microfilm. He died at home, #3 East 53rd Street, New York City, of Cirrhosis of the Liver with contributory cause of Ascites. (By the way, definitions of old medical terms can be found here.) Ascites is defined as: "Collection of fluid in the abdomin, due liver disease or cancer." William Scott Pyle was buried on January 3, 1906, at Woodlawn Cemetery in Bronx, New York. I contacted the cemetery to see who else was buried in this plot. The mausoleum includes his wife, Mary Vanderhoef Pyle (1860-1946), James V. Pyle (likely a son who died young), William Scott Pyle, Jr. (1888-1938), and Marie Elizabeth Waller Pyle (wife of William, Jr.). The mausoleum in which the family is buried is very nice, with a beautiful stained glass window (see the Find A Grave memorial for William here) but because there are no marker stones, I can't get dates from that source. I therefore have spent a bit of time exploring other records to learn more about this family. Hi Elizabeth, great find! Now you can add a memorial for him... I remember you mentioning the Pyles having a soap company, and thought that was neat. Karen, Yes, I have added a memorial for William Scott Pyle and his wife, and ultimately will add memorials for the three others in the plot. I have not been in SLC, but requested the image from their Photoduplication Services, a great benefit that FamilySearch.org offers!